The process detailed on this page is how to make the purest Virgin Coconut Oil. There are no preservatives nor cosmetic wax like the ones sold in the shops. If you have any feedback or questions about preparing this, click here to let me know. A mature coconut is dry and the skin that is exposed after breaking the outer shell is dark brown. 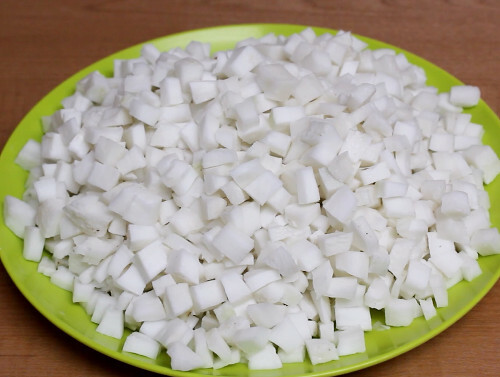 The coconut meat and the water are very sweet. The following are some of the uses of Virgin Coconut Oil. 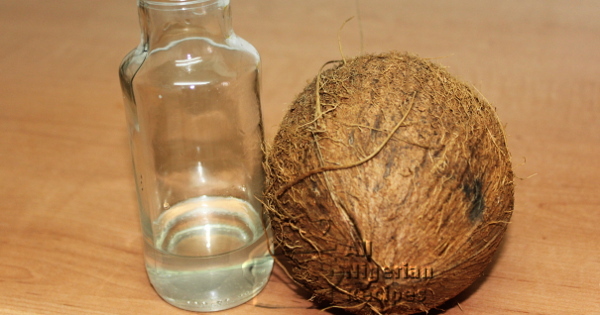 Virgin Coconut Oil is a great hair moisturiser especially for coily African hair. So if you are an African naturalista, you should be making yours at home. It is a great moisturiser for your body. Virgin Coconut Oil will keep your body supple without the shine. It also helps keep those skin conditions (eczema, heat rashes, nappy rashes, craw-craw lol) at bay. Have you ever done coconut oil pulling? Coconut Oil pulling is oral detoxification that is done by swishing or gargling a tablespoon of virgin coconut oil in your mouth for 15 to 20 minutes. This helps reduce harmful bacteria in your mouth and improve oral health. For cooking: use it as salad dressing. Add virgin coconut oil in your cooking to give is a coconut flavour. But do not use it for deep-frying because it has a low smoke point. You can use it for low heat stirfrying or for fried eggs. Use the refined coconut oil for deep-frying instead. Or just use vegetable oils and sun flower oil because they are better for frying. Rinse the coconut meat with cool water and cut into tiny pieces to help your blender. Place in a blender and blend into a smooth paste with warm water. You can also use a grater for this purpose. But a blender is more efficient, you get more coconut oil when you use a blender. Pour the blend into a sieve with tiny holes so that none of the chaff gets through. 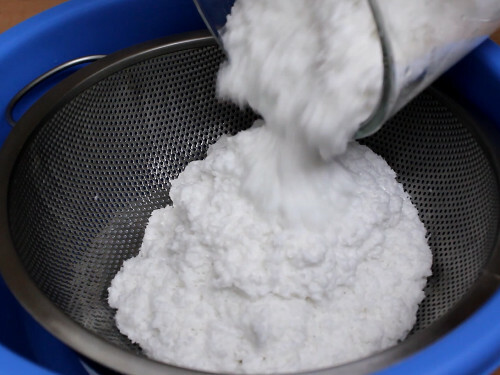 Blend the chaff with warm water to get out even more coconut oil, pour in the sieve and squeeze out the coconut milk. Pour the coconut milk (mixture of coconut oil and water) through a chiffon or cheese cloth to remove the tiniest coconut chaff. From here on, there are two methods of extracting the virgin coconut oil. For this method, you will need a fridge. Pour the coconut milk into a transparent bucket or plastic bag. Hang the plastic bag vertically somewhere or leave the bucket in a cupboard and check it every 24 hours: see video. The coconut cream at the top will ferment and the virgin coconut oil will appear. If the weather is hot and humid where you live, this may happen in 24 hours. If you live in a cold region and do this in the winter, it will take longer for the oil to appear. 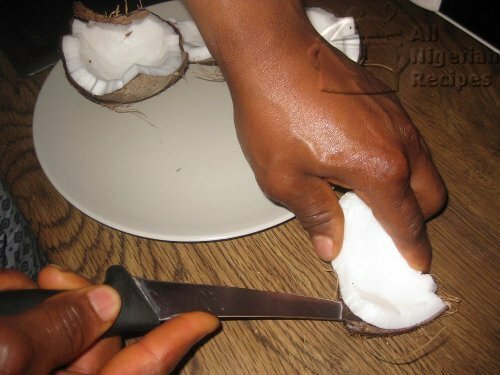 Once you see the oil, put the bucket or plastic bag containing the coconut components in the fridge for about 1 hour and the part that is the pure virgin coconut oil will become solid. Take that part, use knife to cut off any fermented parts that stuck to the slab. Rinse the slab and pat dry with a paper towel. Place in a container and put in your cupboard till the slab of oil becomes liquid. Any fermented bits present in the oil will settle at the bottom. Decant the oil at the top into a clean dry container being careful not to pour the fermented bits. Your pure Virgin Coconut Oil is ready! For this method, you will need a plastic bag and a sharp pointed clean tool eg a needle or toothpick. 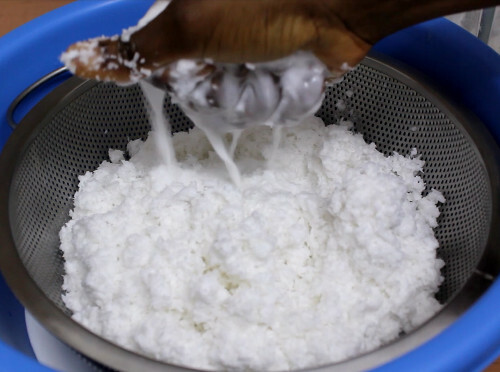 Pour the coconut milk into a trasparent plastic bag. Gather the plastic bag and tie the mouth with a rope such that the other end is pointed. Hang the bag vertically. After 20 minutes, you will see the contents separate into conc. coconut milk and water. Leave it hanging there and check for signs of fermentation and appearance of Virgin Coconut Oil every 24 hours. Once you see the oil, place a container below the hanging bag such that any liquid from the bag will drip into the container. Use a needle or toothpick to puncture the area around where the oil is in the bag. Please see the video below for details so you do not puncture the wrong place and contaminate your virgin coconut oil. Make as many punctures as you wish but only in the area where the oil is. Then wait and the pure oil slowly drips into the container below. When there is no more oil in the bag, pour the collected oil into a container and close. Your pure virgin coconut oil is ready for use. Keep an eye on the coconut milk during fermentation, you do not want it to ferment so much that it will start smelling. If that happens, your virgin coconut oil will have a foul smell. Since there is no heat involved in processing this virgin coconut oil, it may become solid at room temperature especially in cold regions. But that's fine. Use as stated above and if you have any feedback or questions about making your own virgin coconut oil, click here to ask me.